With programs like our low price guarantee* on all newly modified wheelchair accessible vehicles, AMS Vans continues to be one of the largest manufacturers of handicap conversion minivans. Once you choose the side or rear entry wheelchair accessible van that&apos;s right for you, AMS Vans can deliver your minivan directly to you in Spearfish, South Dakota or nationwide (delivery fees may apply) and offer our complimentary white glove service that includes an in depth tutorial from a mobility professional. Once you&apos;ve had a chance to see your modified wheelchair accessible vehicle from our inventory in person, if you aren&apos;t 100% satisfied upon delivery, we&apos;ll take it back. Both new and used mobility vans with new handicap conversions by AMS Vans come with a solid warranty, national service, and a 24-hour emergency conversion help line for as long as you own your handicap accessible van. New and used minivans in Spearfish, South Dakota can be converted into AMS Vans brand wheelchair vans. Most Chrysler, Honda, Dodge, and VW minivans are compatible with our AMS Vans Legend, AMS Vans Edge, or AMS Vans Edge II Long Channel handicapped vehicle conversions. Accessible mobility equipment add-ons such as jump seats and hand controls are available for installation to customize your mobility van to your specific needs. Buy a brand new minivan with a new AMS Vans Conversion in Spearfish, South Dakota and nationwide. AMS Vans converts Dodge, Honda, Chrysler, and Volkswagen minivans into any of our side or rear entry handicap vans. 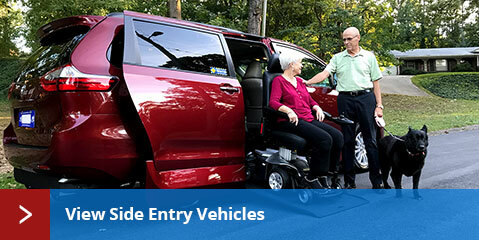 Save even more money on a wheelchair conversion on a new vehicle with mobility rebates offered by minivan manufacturers. The AMS Vans inventory of used handicap vans offers AMS Vans brand minivans with both new and used handicap conversions as well as used handicap vans from manufacturers like Rollx, Braun, and VMI in Spearfish, South Dakota and nationwide. Purchasing a used minivan doesn&apos;t subject you to the loss in value that occurs when buying a new vehicle. Any used minivan with a new handicap conversion by AMS Vans comes with an incredible conversion warranty and the remainder of the manufacturer&apos;s warranty on the minivan. 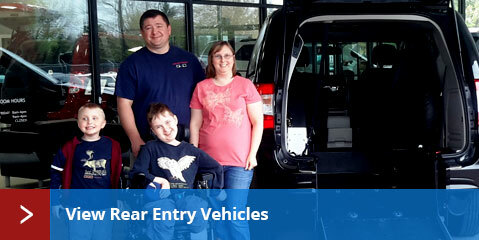 Sell your wheelchair accessible van or un-modified minivan to AMS Vans directly. We buy in Spearfish, SD and all across America for a great price, nationwide pick-up, and quick cash payments. Sell your used Braun, VMI, or Rollx handicap vehicle through the AMS Vans direct buy program to sell your minivan quickly and for top dollar. Customers are constantly leaving feedback stating how much higher our offers are for used handicap vehicles then other dealers. AMS Vans accepts used handicap vehicles from Spearfish, SD and nationwide for trade on new AMS Vans conversion minivans and for cash on AMS Vans brand handicap conversion vans that you no longer need with our Buy Back Program. Used minivans without wheelchair conversions from Dodge, Chrysler, Honda, and Volkswagen from Spearfish, South Dakota can be sold direct to AMS Vans. Although new AMS Vans wheelchair vans are priced much lower than leading competition, AMS Vans modifies gently used minivans with a new ramp conversion to provide an even lower cost solution. Find buyers and sellers of wheelchair minivans and other modified vehicles in a "for sale by owner" environment. AMS Vans brand handicap van owners can list their used handicap accessible vans for free in our mobility classifieds for the first month. Don&apos;t take on the task of selling your used handicap accessible van through classified ads alone; AMS Vans will handle the sales process for you from wording your ad correctly to get noticed, to answering questions from potential buyers through our mobility consignment program. AMS Vans is rethinking how dealers sell wheelchair accessible vans by selling direct online to keep prices low and having your own personal handicap van lot that&apos;s open 24 hours a day, 7 days a week without high pressure sales associates and only as far away as your computer screen. We proudly display wheelchair van customer testimonials on our website so you can get unedited comments from real AMS Vans customers in Spearfish, South Dakota and nationwide about their experience of purchasing a wheelchair van from us. We believe in word-of-mouth advertising through past experiences as well, and if you direct someone to us that mentions your name during the sale, we&apos;ll send you $250. AMS Vans won&apos;t stop finding ways for every family and business that needs accessible transportation to own a low cost, quality wheelchair accessible van.